Arriving on La Isla, gracias Copa Air! Teaching in Colombia recently provided more generous time off from school, and a week in the breezy Caribbean to escape the constant heat of Barranquilla seemed perfect. Straining a volunteer budget to pay slightly more for a nonstop ticket with Copa Airlines was worth it to avoid plane-hopping and crazy departure times. Copa delivered an adequate 90 minute flight over open, deep-blue waters from balmy Barranquilla to gorgeous Isla San Andrés. Arriving to Isla San Andrés felt like dreamy deja vu. Having lived in the Caribbean as a child, hearing friendly islanders speak with beautiful Creole-Caribe accents, saying “mon” (man) and “dos det der,” (those right there) evoked vivid memories. The look of brilliant smiles, the smell of salty sea air and the sounds of a beachfront calypso band resonate and linger… long after a visit to the islands. 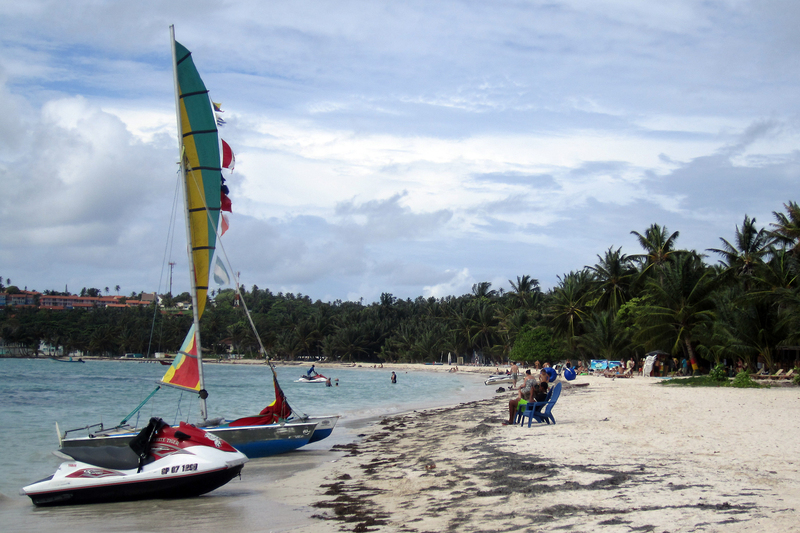 Sprat Bay, also called Playa Centro, sits at the edge of the downtown area, near discount tourist stores and duty-free shops. Mesmerizing blue waters and white sands beckon provocatively, calling for the traditional taste of a Cuba Libre and the aromatic blend of cocoa butter on tanned skin. Walking the beach with a smile and clipboard, William approached sunbathing tourists, selling an afternoon lancha to El Acuatico, one of many Isla San Andrés attractions. Around 3:00 pm, a boat launched from the nearby marina, carrying the Capitan, thirteen Argentines, two Chileans, a family of four from Manisales, and one Gringa from Barranquilla. Johnny Cay is a splendid little island, on this day scattered with tourists and locals seeking shelter under palm tree palapas from an afternoon thunderstorm . The group spent a few minutes at Bibi’s Place before walking to the next smaller island and El Acuatico. Walking in Neoprene water shoes, holding a bag of beach possessions over your head, trekking through ocean tides surrounded by large fish and manta rays feels both ridiculous and fun. Crowds of families gathered on the shores of El Acuatico drinking Aguila and socializing while in the water one medium-sized manta ray flopped loosely in the arms of a man, posing for photos with swimmers. During the return journey from Johnny Cay, the fearless blue eyed capitan stopped to tell the history of the cay and its ecosystem while a tour guide dove into open waters, emerging with a glorious, hefty estrella del mar. Passing the starfish around the small boat, it seemed a magic connection happened between the passengers and the early evening sea. Collectively, everyone cheered on Max from Argentina, tempting him to make the next dive in (he didn’t). Many buses in Isla San Andrés are no bigger than 16-passenger cargo vans with a front and a back door; somehow they miraculously seem to hold up to 30 passengers… with the doors open. A short bus ride from the esquina in El Centro is La Piscina, a tourist attraction worthy of noting for its eclectic history and friendly propietor, Leard Pomare Myles. The land of La Piscina has been in Pomare’s family for centuries; in 1971 he decided to create a tourist friendly area to celebrate the natural pool where exotic fishes gather and swells crash upon rocky cliffs. After Hurricane Joan ripped through in 1988, Pomare erected an open-walled snorkel rental shelter and restaurant offering delicious fresh seafood for hungry pool-jumpers. With a beautiful relaxing pool area and historical island information courtesy of Pomare and his sons, La Piscina has become an established landmark. Coctel de Camarones and a Crab Empanada. Delicious! Isla San Andres may lack big-city lights but it has a vibrant nightlife, and is relatively safe for walking around after dark. Motos are everywhere, flying over the asphalt, carrying up to four passengers, all dressed to impress. Discotecas like Éxtasis and Coco Loco boast their biggest crowds from Thursday to Sunday nights. El Viajero, a hostel group with locations in Colombia and Uruguay, occupies a 5-story building in El Centro, with a generous, patio bar on the top floor. Refreshing Caribbean night breezes blow through El Viajero as the DJ spins popular music and the bartender serves drink specials. A few nights during the week, El Viajero has free salsa classes, interactive games and Ragga Ragga dance lessons led by the enthusiastic staff, getting travelers warmed up for a night out on the island. Music is prominent on Isla San Andrés, offering a spicy hybrid of Nigerian, African, Caribbean and Colombian influences. The “island sound,” is a blend of calypso, soca and reggae with vallenato, salsa, hints of gospel music and United States R&B, resulting in a chaotic mix that inspires people to dance and sing. Ragga Ragga, a Jamaican-based sub-genre of reggae, is mostly electronic music with a beat similar to hip hop. Sampling other songs, Ragga Ragga blends to form “ragamuffin music,” or “raggamuffin” deriving its name from the music of Jamaica’s “ghetto dwellers.” Tourists and locals love dancing the bow-legged, chest-pumping movements, trying to decipher the words as they sing. The historic Iglesia Bautista, founded in 1844, is a small church perched on a hill near the neighborhood of La Loma. While not especially dazzling or architecturally striking, Iglesia Bautista provides a stunning view of nearly both sides of Isla San Andrés; with its hilltop location, the church may be seen from many spots around the island. Even on rainy days, the humble little church seems to glow proudly on its generous grassy terrain. Single-paned windows tinted in primary colors and a simple congregation with dark wood pews make Iglesia Bautista is a sweet reminder of the early days gone and faith still present in Isla San Andrés. Looks like the inside of the churches on Antigua. Cute. Near the Iglesia is the town of La Loma, with multicolored wooden houses and children playing futbol as mototaxis zip by on the main road. Some houses feature two stories and wraparound porches, while others offer lunches of Comida Tipica de Isla, like Rondon, a traditional stew with pescado de leche de coco (fish cooked in coconut milk). La Loma, Los Motos and El Perro! Cayo Rocoso, located at Sound Bay, is a picturesque beach with calm shallow waters and soft bleached sand. Upon arrival, it appears to be a private beach for guests of Decameron, but it is actually a public space where $10000 COP will get you a lounge chair for the day. Nearby is a full bar and tienda for drinks and snacks. In the water, several meters from the beach, is the large rusty cadaver of the ship Nicodemus, once owned by Aristotle Onassis in the 1980’s. The rumored tale is that Nicodemus suffered damage during a storm and was being towed near Cartagena when it split into three parts, two sinking to become reefs and the third a rusty monument to the shipping tycoon and his many adventures. Between the shipwreck and beach is a tiny island with a natural aquatico, offering visitors a safe spot to snorkel among coral and barriers. Another walk through crystal blue waters carrying a bag overhead gets you from Rocky Cay to the little island. Randolph, a San Andrés native, works on the island renting snorkel masks and diving down for anemones and spiny starfish with visiting children whose parents swim nearby. On this day he presented a huge sea urchin for our group to hold. Randolph told the story of the island, which was once occupied by a man for 9 years, who lived in a small house and fell in love with a Chilean woman. Though the little house is now gone, and the couple now resides in the city of San Andrés, a large flag from Chile flies on over the tiny island. For the final days of this visit to San Andrés, Randolph from Rocky Cay offered a tour of the island by mototaxi, which turned out to be an inexpensive way to see some remaining areas through the eyes of a local. Zipping through traffic of El Centro, out to a road bordered by beach on one side and jungle on the other brought miles of smiles. Randolph and the day’s tour vehicle. Fun! First passing the Casa Museo – a museum showing life as it once existed on the island in a traditional home. Two women in casual beach sarongs smiled and called to golf carts driven by tourists, “Ayrie, come to the Casa, mon!” encouraging them to stop. Continuing on to pass Morgan’s Cove, Randolph stopped at a small reggae-themed coctel bar which occupied both sides of the road – an ingenious way to catch traffic in either direction. The owner of the coctel bar busily swept the area, happily greeting guests and suggesting a fresh coco loco libation. Visitors took photos and relaxed in the swings and hammocks overlooking the opulent tiny private beach. Riding on revealed the huge rocky cliffs in the center of San Andres, Cerro La Loma, also known as El Cliff, which some say is due to the eruption of a volcano which threw rocks older than the seafloor to the surface, creating the island. A massive bulk sprouting jungle vines and menacing uneven terrain, it is easy to imagine El Cliff as the set of Peter Benchley’s The Island, were it not for the beautiful houses and small farms surrounding its base. Walking to the airport, as travelers towed roll-on luggage over rocky sidewalks, the Caribbean sky beamed a brilliant blue with giant billowy clouds. A group of locals eating at a corner tienda discussed the results of the previous night’s friendly partido, where Colombia won over El Salvador 3-0. “Den it wa oba, ba Argenten, don cry!” a man laughed, mocking the futbolistas. As the departing plane jetted upward beyond Isla San Andrés and its turquoise seas, white sands, delightful people, infectious music and savory dishes, its hard to imagine anyone leaving this paradise who don cry at least a little. Ragga Ragga! This has to be your best yet. When I got to “Stir It Up” on the CD, my memory took a jump. 1974 – and the beat goes on! Thanks! Bob Marley and Lord Short Shirt… ire! Crab Empanada…….. looks good, I want now, me bungry!!!!! It was delicious! Bungry… better + hungry? !